Hotel was clean, modern and provided amenities like refrigerator, microwave, dishes and pool towels for the beach. Staff was very friendly and helpful. Location was within walking distance to restaurants. Good local transportation. 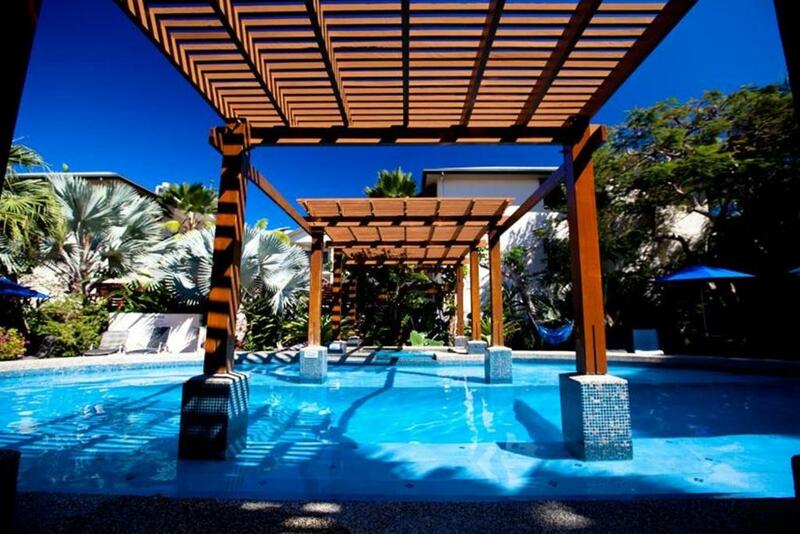 Excellent value for money and very close to the 'downtown' area of Port Douglas. Anne at the front desk was fantastic and helpful throughout. Can't wait to get back! Owner Anne went out of her way to make us comfortable. Lots of advice and information regarding visiting local sites. Had a good time despite bigs rain storm. The apartment was nice and clean. Anne was very helpful and made our stay very comfortable. 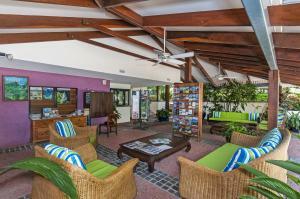 Quiet, clean, well-maintained, with very good air conditioning-a real plus in the tropics. Host was pleasant and very helpful without being intrusive. Excellent host -- the elderly gentleman was happy to give local information/guidance/map. Arrived after they close the office at 6 pm, but provided easy instruction to pick up keys through the lock box outside the office. 2 mins drive or 5-6 walk to the beautiful four-mile beach, where we got to see amazing colors sky colors around the sunset (see the photo). 3 mins drive to the shops, including Coles for grocery. Well maintained swimming pool and spa/jacuzzi which we enjoyed twice during our 4-day stay. Covered parking, washing/dryer, etc. Well kept property on the main road leading to and close to the town center. Look for a garden view apartment if available (in case you would have time to seat in the balcony in the evening). Anne was incredibly helpful in so many ways; giving us fantastic advice for activities with a limited time frame. This enabled us to make the most of our short stay. 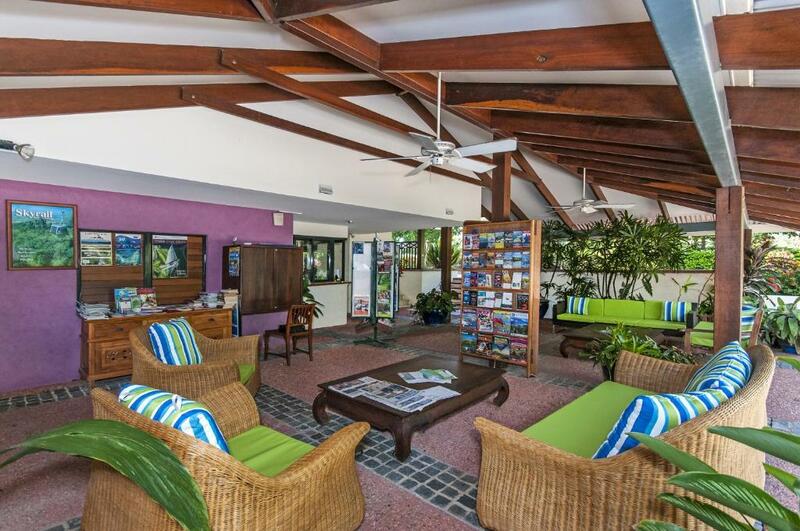 The owners of the facility are a lovely husband and wife who were very helpful in booking airport shuttles by email and excursions once at the hotel. Pool was cute Great location! Swimming pool, comfortable rooms, very clean, good amount of local information. 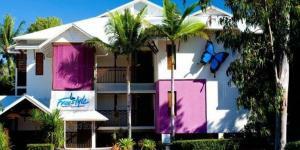 Lock in a great price for Freestyle Resort Port Douglas – rated 9.1 by recent guests! 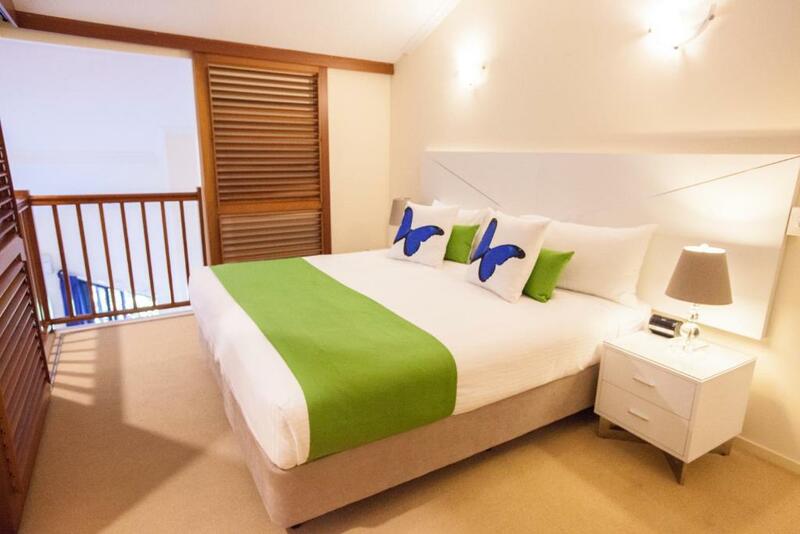 Freestyle Resort Port Douglas This rating is a reflection of how the property compares to the industry standard when it comes to price, facilities and services available. It's based on a self-evaluation by the property. Use this rating to help choose your stay! Just 5 minutes’ walk from Four Mile Beach, Freestyle Resort features a heated saltwater swimming pool and free WiFi. 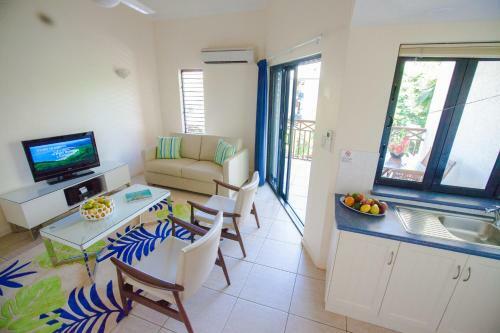 Surrounded by tropical gardens, it offers self-contained apartments with a private balcony. Freestyle Apartments are located in the heart of Port Douglas, 7 minutes’ walk from shopping and dining on Macrossan Street. The Port Douglas Marina is a 10-minute walk away. Guests can relax in the heated spa pool, or enjoy a casual meal in the barbecue area. The tour desk can recommend local attractions and help guests book trips to the Great Barrier Reef. All apartments are elegantly decorated, and include a well-equipped kitchen with a dishwasher and microwave. Each apartment has a spacious seating area with cable TV and a DVD player. When would you like to stay at Freestyle Resort Port Douglas? This air-conditioned apartment features a private balcony or patio, a full kitchen and a separate living room. Interconnecting apartments may be available upon prior request. For further information please contact the property in advance, using the contact details found on the booking confirmation. Please note that all two-bedroom apartments are on the second floor and have internal stairs. Please note this room type cannot accommodated additional guests. This air-conditioned apartment located on the ground floor or with garden views. Features a full kitchen and a separate living room. Personal Service ... We would like to introduce to you, your hosts, Jason & Anne Moore who have managed Freestyle for over 12 years. Jason & Anne have travelled extensively and bring that level of service & attention to detail to their management of Freestyle Resort Apartments, ensuring you a most memorable and great holiday in Port Douglas They can provide you with current advice and recommendations on all of the best that's on offer in & around Port Douglas and the region. 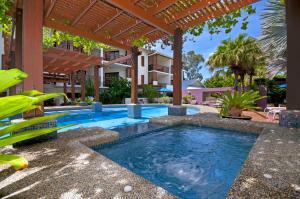 House Rules Freestyle Resort Port Douglas takes special requests – add in the next step! Freestyle Resort Port Douglas accepts these cards and reserves the right to temporarily hold an amount prior to arrival. Please note that front desk hours are from 8 am to 6 pm. Guests arriving outside front desk hours are requested to contact the hotel in advance using the contact details found in the booking confirmation. An airport shuttle service is available for an additional fee. Please contact the resort 48 hours prior to arrival to organize an airport shuttle service. Please inform Freestyle Resort Port Douglas of your expected arrival time in advance. You can use the Special Requests box when booking, or contact the property directly using the contact details in your confirmation. Living area is very small, dinning area is outside on balcony. No screen door so couldn’t leave door open because of insects. Kitchen small with very little bench space well equipped though and does have convection microwave. Ok if you want to eat out and not cook. Bedrooms don’t have any natural light. Foxtel and Netflix did not work due to poor internet. Anne was a wonderful, thoughtful and considerate host! She thought of absolutely everything for a perfect stay. Freestyle Resort was well-designed, comfortable and relaxing. Loved the tiny frogs in the water lily pond! Freestyle Resort is an absolutely great hotel and I would wholeheartedly recommend it to anybody. Its greatest treasure is the proprietor Anne. She was extremely helpful in answering questions before our stay, arranging transfers and tours, providing electricity adaptors and anything you can think of. The hotel itself is an easy 10-15 walk into town and an even closer distance from the Marina. The apartment consists of two connected rooms plus a bathroom plus a veranda of considerable size with a large table and several chairs. The rooms are airconditioned with a very good quality (and quiet) airconditioner. Because of the clever room distribution the airconditioner air stream does not hit directly onto the bed, which makes sleeping at night very pleasurable. The kitchen is well furnished with stove/microwave, fridge, coffee machine, etc. There is a nice big TV with many channels and a great stereo system. The bed is very comfortable. Also, the property is close to the main road (which makes communication by car easy) but the rooms are quiet. Finally, there is a nice swimming pool with jacuzzi function and a great lighting at night. Overall - a very highly recommended property which provides the best value for money! Thanks again to Anne for her hospitality! The staff were excellent, so helpful and accommodating. They organised airport transfers and even ensured I had early access to my room so my little one could have his midday nap. Couldn’t do enough to help. Loved the pool. - It would have been great with some more plates, glasses and cuttlery. As it now was, we had to run the dish washer after every other meal. - We stayed for three nights and noticed some residue on the pool floor. Unfortunately the pool cleaners only arrived on our departure day. - We had a very nice two-level apartment, where the living room had a very high ceeiling. Two bedroom-bathroom combos were stacked on top of each other in the other part. Jalousies led out from the second floor, leading to a very airy and semi-open atmosphere. This solution also made is possible for the ceiling fans to move the air, and the air conditioner to do it's job. - The balcony, over-seeing the pool area, was very nice and presented us with an excellent spot to play a game of cards before bed time. When we opened the door to our room this intensive smell of mold came. We asked the staff directly if she could smell it but she could not. She blamed that we smelled like lemon from our bugspray. We opened all doors and windows to get rid of the smell but after a few hours it was still there. We asked if we could change room but Anne advise it was not possible because she still could not smell the mold and this room is what we have booked she said. We understood that she didn't want to do anything about it and we let it be. Hopefully we will not be sick from the black mold they have.. Location were good in this city. Not to close to the center and not to far away either. The accomodation had everything we needed and the best was the wonderful birds just outside our terrass. The checkin were great and Anne showed us around the facilities and also told us about the town and the restaurants. Nothing at all. Lovely place to stay with warm welcome and nothing too much trouble. 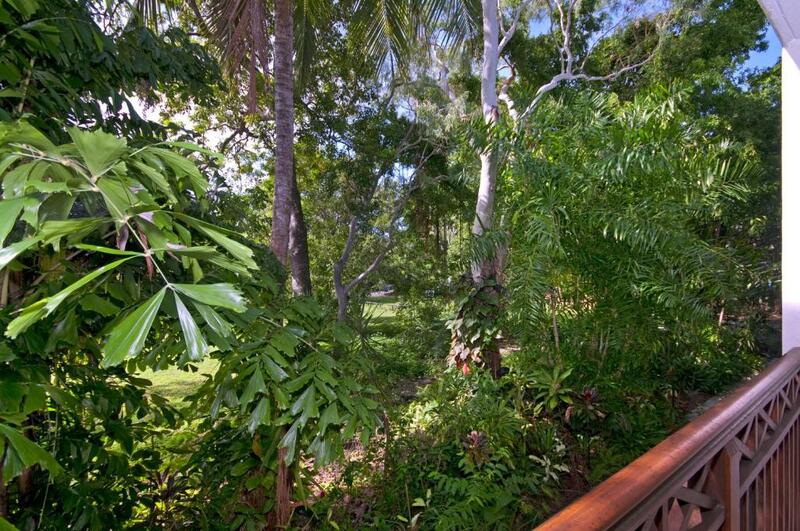 Great location for short walk to Port Douglas. Easy bus service if you prefer. Good bedroom, friendly staff, plus a great pool. Cleanliness was disappointing with amount of hair on the bedding and bathroom. Hospitality of managers and location was great. The room was incredibly spacious and comfortable. The pool was magnificent and its surroundings were serene. Anne was extremely helpful and nothing was too much trouble. Anne is a lovely host. Was very friendly and full of great ideas and suggestions of amazing places to see. The rooms were clean, spacious, comfortable and quiet. Just what we were looking for! Anne was always there to help with anything. Lovely quiet room and great pool and facilities. 8 min walk to Macrossan Street so nice walk in the morning. Also 8 min walk to Four Mile beach. Walked everywhere during the week I was there.